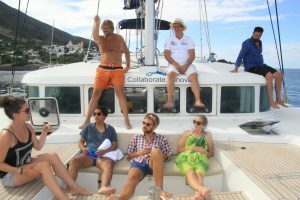 You might join us for a few weeks on Coboat either in the Caribbean or in the Med but mostly you can work from wherever you want. Interested? Submit your application (CV, photo) to greatestjob@coboat.org explaining why you’re interested in the role, and the skills you bring. We’d like to hear both about your skills and experience in community building, and about your interest in Coboat specifically. Follow us at fb.me/coboat and @gocoboat on Instagram and Twitter. Where is Coboat right now? Follow the progress of Coboat cruising and exploring the Seven Seas. Join the community and stay updated! You want to be on Coboat?